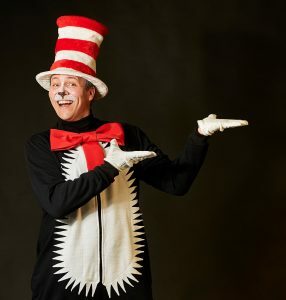 The National Theatre’s adaptation of Dr. Seuss’s “The Cat in the Hat” is a lively, engaging “play with sound effects”. Not a word has been touched or added to Dr. Seuss’ classic, ensuring that anyone who’s read the story will find themselves transported into the world they’ve always imagined. From the moment his tall, red-and-white-striped hat appears around the door, Sally and her brother know that The Cat in the Hat is the funniest, most mischievous cat that they have ever met. With the trickiest of tricks and the craziest of ideas, he is certainly loads of fun. He turns a rainy afternoon into an amazing adventure… but what will mum find when she gets home…? The show is directed by Jason Hammond. 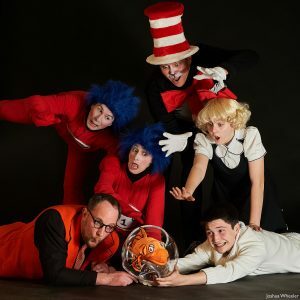 The cast includes; Steven O’Shea as the Cat in the Hat, Frances Thayer as Sally, Marcus Lucia as Boy, Emily Jo Shepherd as Thing 1/ Kitten, Barrett Shepherd as Thing 2/ Kitten and Aaron Baikie Rick as Fish.